The Sandalwood tree is a semi-parasite that requires a host plant for obtaining minerals and water which it acquires by sending out roots and attaching them to the roots of other plants. Sandalwood Oil can only be obtained from the heartwood of the tree and the most valuable source is the roots. Long revered in traditional Chinese and Ayurvedic medicine, the documented use of Sandalwood Oil from the white sandalwood tree (Santalum album,) native to India, also known as Mysore sandalwood, goes back more than 4000 years. It is one of the oldest known commodities valued for its scent. Genuine Sandalwood Oil is expensive and rare, due to high demand, dwindling resources and the fact that the tree is difficult to propagate. Additionally, the tree needs to be at least 30 years old before being considered suitable for harvesting. For this reason, Sandalwood Oil is one of the most often adulterated, blended and substituted oils. Cheaper varieties come from Australian, New Caledonian and West Indian sandalwood. Sandalwood Oil is made from the wood by steam distillation or CO2 extraction. It smells rich, woody and exotic and is pale yellow to gold in colour. The major and most important component of Sandalwood Oil is the sesquiterpene unique to the tree called alpha-santalol. It also contains beta-santalol, santyl acetate and santalene to a far lesser degree, as well as over 100 other constituents. Sandalwood Oil has a wide range of uses in both traditional medicine and aromatherapy. One of the most significant of these is to sedate the nervous system and experiments have confirmed that it is a natural calmative, slowing down brain waves and alleviating anxiety, depression, insomnia and nerve pain. It is also antiviral, antibacterial and antifungal with anti-inflammatory, astringent and antioxidant properties. Used topically, Sandalwood Oil is hydrating and moisturising, suitable for all skin types but particularly dry, cracked, damaged, inflamed and mature skin. Because it is slightly astringent, it is also toning so good for oily skin and for preventing scar formation. Additionally, the alpha-santalol in Sandalwood has been studied for its chemopreventative action against skin cancer. 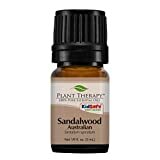 Sandalwood Oil is used extensively in aromatherapy massage to treat nervous disorders, pain, chest infections, asthma, frigidity, impotence, haemorrhoids and inflammation. It is particularly effective for problems with the genito-urinary tract, reproductive organs and bladder, especially in men. It can be diluted as a gargle, in massage oils and in the bath, in lotions and creams, in hot water as a steam inhalation or used neat. More than any other essential oil, Sandalwood Oil is regarded as a superior anti-aging treatment and tonic for the skin, relieving the redness and irritation associated with rashes, acne and eczema.